By Jove, I think she’s got it!! The thread for my Blue Girl rose motifs arrived, a day early!! WHOOT! 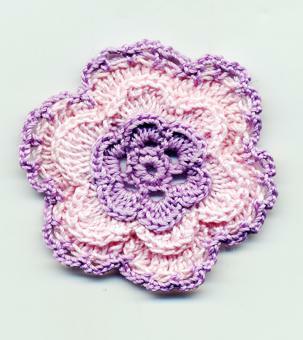 Now I can finish Sharon’s Rose Parade doily! 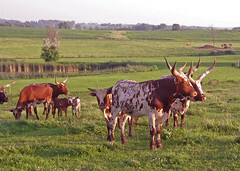 We took a short drive up the road for a photo shoot, and learned more about some local long-horn cattle on Hwy A. 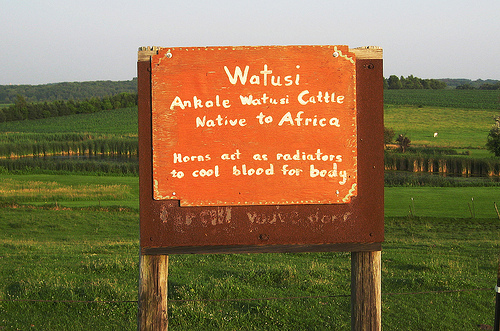 There was a sign out front posted, and it told us of the Ankole-Watusi Cattle, of South Africa. There were two new calves this time, which were immediately surrounded by the “auntie” cows, while a formidable bull herded another female away from the group. What was so amazing were the horns-they were massive, one fellow’s rack spanning nearly 5 feet and thick as trees at the skull. I also got some new photos of some local barns and silos. One tile silo gleamed in the fading sunlight, looking as brand new as the day it was erected. All in all, it was a glorious day.